I was born into this latest migration of the Jewish nation, from European provinces to the promises of a new land of ultimate opportunity. I was born – 1974, Memphis Tennessee, Cary Renee Kaplan. Babble, as in "speaking incoherently”, a meaningless cocktail of words and sounds. 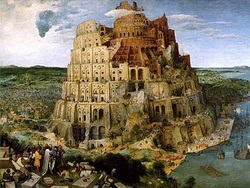 Babble, as in “the Tower of...” The Tower of Babel, is after all, culled from the Hebrew word bilbul, meaning confusion, being mixed up, stirred together, intermingled (intermarried?). America stands as the epitome of bilbul, the archetypal mixing bowl, the melting pot into which all are welcomed...stirred-up, stirred-in. The Bible I learned in my buckle-belting youth was more babble than Bible. Was more torn-up than Torah. Was more Christmas than Hannukah. More heysus than the yud-heh and vav-heh of God's name to which I now daily pray. But, as 'Jewish' as I get, no matter how many scarves I wrap around my head, no matter how long my hem, no matter how many times in one conversation I close my eyes and say “Baruch Hashem…” Still, when I stub my toe, I let out an irrepressible howl of “Jeeezus Christ!” Like a natural reflex...I call out to what is, after all, a foreign god. It's an all-too-telling Americano-evocation of the god of stubbed toes and other small inconveniences. And perhaps that shouldn't be a problem, a little unconscious slip of the tongue never hurt anyone. But, I am a big believer in making the unconscious conscious. So a subtle under-the-breathe call out to a foreign god is no small incident for me. It is a moment of ultimate bilbul, of confusion, an unconscious mixing and stirring, a foreign infusion. It is a twisting of tongue from mother tongue to other tongue. Where identity is undone. But let's get back to Memphis, the stage upon which this story is set. Memphis Tennessee begot her name from no less than the first royal city of Egypt. The original Memphis stood majestic along the Nile river, just as my Memphis sort of slouches against the great American Nile - the Mississippi. Memphis even once had a football team called the pharaohs. A little hint to the wise, never name your sports team after THE biblical archetype of the bad guy defeated by a pack of slaves! Why tempt God? If there was ever a team destined to be defeated this was it! Oh, and speaking of destined for failure, there’s the famous Memphis Pyramid. Or not so famous. Maybe you've seen pictures of it. It's this massive pyramid of mirrors, planted there along the river. A building which went from a failed concert/sports arena to a mega-church to now housing - a Bass Pro fishing shop. That's right y’all, servicing all your fish pole and handgun needs. Like the great pyramids of lore, made to represent the sublimest ideals of Egyptian culture, so too the Memphis pyramid now stands as an icon of the highest of Southern heritage – huntin' and fishin'! A pyramid with a sharp-point, but otherwise rather pointless. Although I suppose it does have one very poignant point for me, personally. It's my very own larger-than-life standing symbol of my 'leaving Egypt'. The perfect stage from which to launch my own epic reliving of my ancestral exodus. From the Mississippi Delta to Delta airlines – Flight #322, Memphis to Atlanta, Atlanta to Tel Aviv. Where you age 40 years in the span of just 18 grueling hours! And so it was with a strong hand, that I was plucked from my Egypto-Southern wasteland.